Thursday, March 20, midnight. Saturn and the moon rise together just before midnight in the southeastern sky. 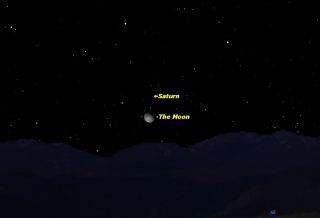 Earlier in the day, the moon occulted Saturn as seen from northeastern South America, southern Africa, and Madagascar. Spring has officially begun in the Northern Hemisphere and the brilliant planet Saturn is kicking the stargazing season with a celestial meet-up with the moon overnight tonight and Friday (March 20 and 21). To see the waning gibbous moon shine with the ringed wonder of the solar system, start looking low toward the east-southeast horizon late tonight night around 11:30 p.m. your local time. Weather permitting, you should notice a bright non-twinkling yellow-white "star" shining sedately closely above the moon just after it rises. That "star" will be Saturn. They will be at their highest, appearing roughly one-third of the way from the horizon to the point directly overhead (the zenith) at around 4:30 a.m. your local time on Friday. The moon’s orientation relative to Saturn’s however will have noticeably changed. That will be because the moon is much closer to us compared to Saturn. Indeed, as you view it late Thursday night it will be situated 861.6 million miles (1.384 billion kilometers) from Earth. But the moon will be nearly 3,700 times closer at a distance of 234,000 miles (377,000 km) and it seems to move much faster against the star background. Initially, when first appearing over the horizon, Saturn and the moon will be separated by only about 2 degrees. Your clenched fist held at arm's length measures about 10 degrees of the night sky. The moon appears to cross the night sky at a rate of roughly its own apparent diameter — or one-half of a degree — per hour. By the time Saturn and the moon reach their highest point in the sky about five hours after they rise above the horizon, the moon will have shifted about 4.5 degrees to Saturn's left. Saturn is currently shining a trifle brighter than the similarly hued star Procyon, the eighth brightest star in the sky. Saturn is often referred to as the showpiece of the heavens because of its spectacular ring system. But you'll need more than binoculars to bring them into view. A telescope magnifying at least 30-power will reveal the famous rings, now tilted more than 22.5 degrees to our line of sight. They are well seen in a four inch telescope magnifying at 100-power and the view is nothing short of stunning through a 10-inch telescope at 250-power. Saturn is a giant planet, second only to Jupiter in size, it is nearly ten times the size of our Earth. Its ring system is about 170,000 miles (274,000 km) across. Through a telescope, Saturn's rings appear solid, like continuous sheets, but in actuality they are composed of countless millions of particles ranging in size from dust-sized to boulders, each one circling like a moon around Saturn and reflecting a little sunlight. Many of these particles are ice crystals. Saturn's rings appeared edge-on to our line of sight and were all but invisible to us in 2009, Since then, they have been gradually "opening up" and will be at their greatest tilt toward Earth in the fall of 2017. Editor's note: If you snap a great photo of Saturn and the moon, or any other night sky view, and would like to share it with Space.com for a story or gallery please send comments and images to managing editor Tariq Malik at: spacephotos@space.com.